„The very first one I saw was a deer head trophy. However, one week ago I stubled across this deer trophy instructions by Jan Krummrey. And so did also Handmade Kultur just a day later. Terrific!!! So my choices were to simply copy the deer or to try something new on my own. 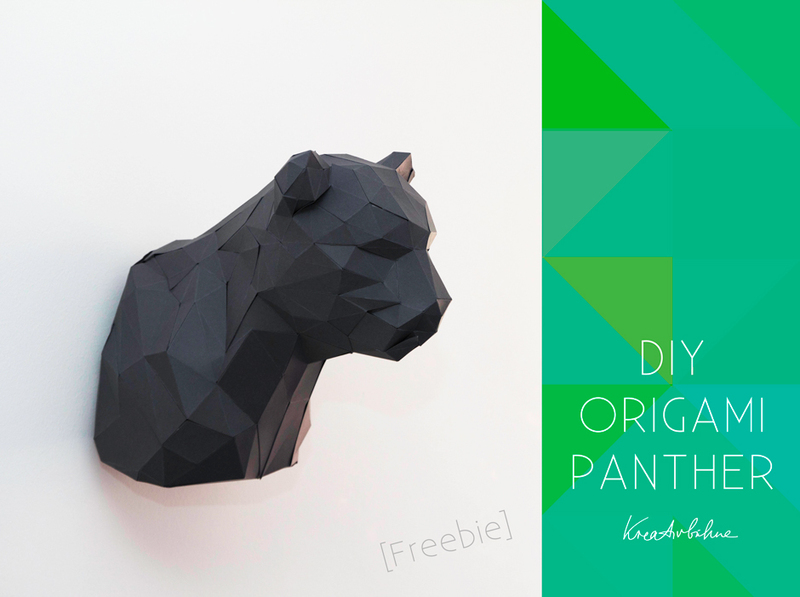 I decided for going my own ways and I have to say that I like my self-made origami panther trophy so much – it is even allowed to decorate my bedroom. Now, I have a print pattern for it. If you‘re interested, it comes together with my weekly newsletter as a little thank you to all subscribers. 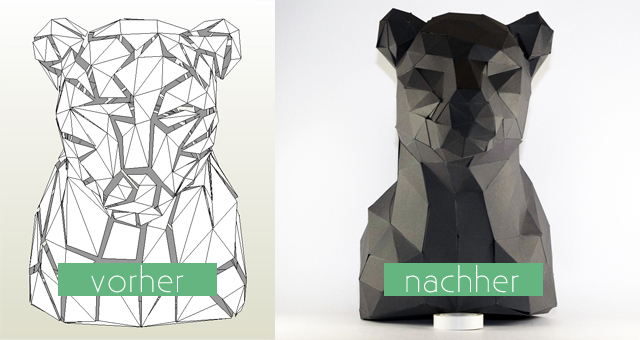 The total expenses for this 3D panther trophy should range about EUR 3.50. I got the paperboard sheets for 25 cents each and it took only a single euro in the print shop. It may take you up to 12 hours until it is ready to be put up at the wall, maybe less if you are very skillfull in these things. At least I didn‘t do all the crafting in one go. 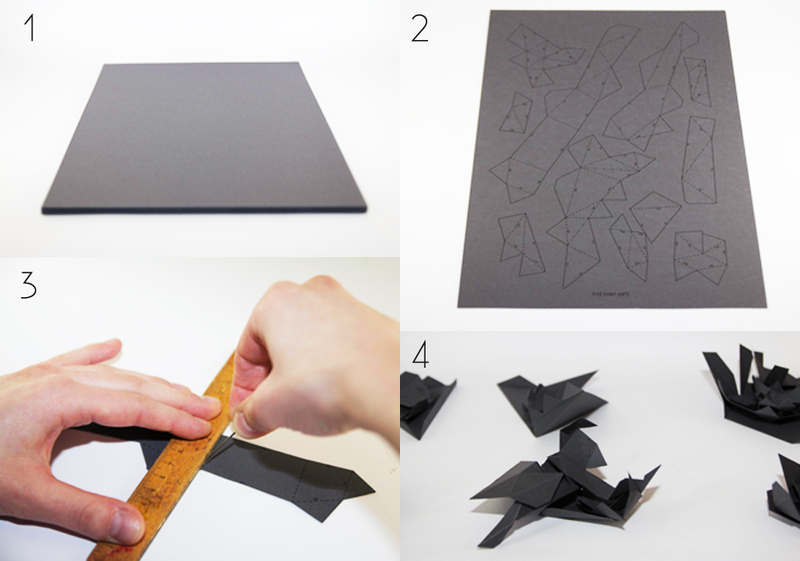 #1: Print out the pattern onto the sheets of gray paperboard. You can find the print pattern in my weekly newsletter. #2: Cut out each piece. Solid lines are to be cut through, dashed lines indicate folding – do not cut the dashed lines! I used the long scissors for most parts. Some corners are a bit more tricky so that short scissors apply much better. However, you may also use a cutter knife to do it. #3: You‘ll see that 300g paperboard does not fold that easily. That‘s why you should first use the stub device, the ruler and some pressure to prepare the dashed lines before folding. Always fold to the inside, i.e. the printed side. #4: Fold all pieces at the dashed lines. Mind that the print labels point inwards such that you will not see the little numbers on the outside later on. I grouped the parts to fill the sheets and to match the order of the numbers, so you don‘t have to spend a lot of time searching for the next piece. You can also find the numbers with the search function in the pdf on your computer. Each glue tab and each free edge is labelled with a number. For example the glue tab number 1 should be glued to edge number 1. 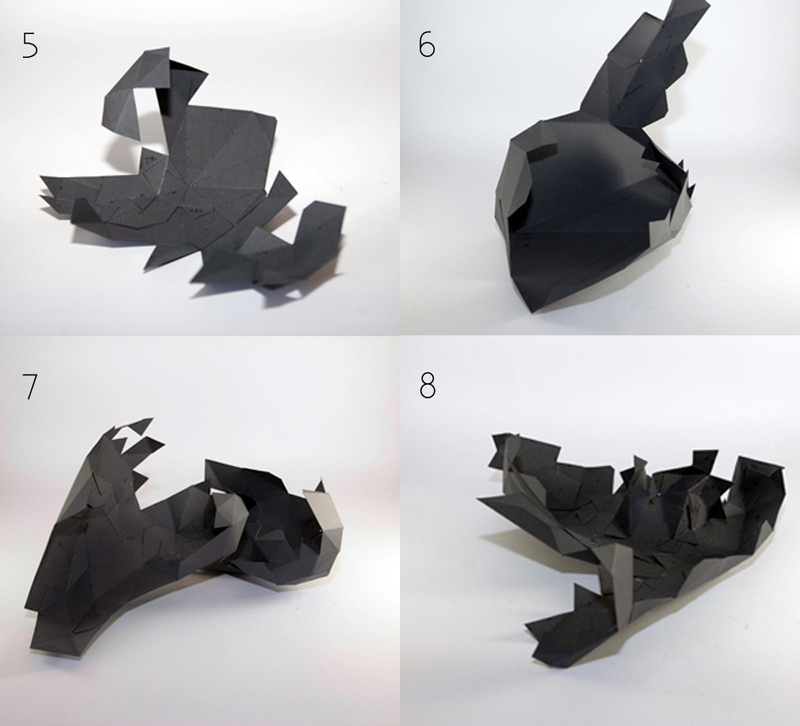 #5-8: These pics show you how the model is assembled. I used double-faced tape instead of liquid glue. This gives clean edges and – if necesary – you can undo it very carefully. I suppose this procedure doesn‘t need further explanations, does it? Finally, I made a little hole in the backside that faces the wall so I can hang it up with a nail. Voilà! First, I did all the cutting and then I started to glue the pieces together. The handicraft work amazed me a lot and I also realized how much I wanted to see the final product. Beware – this is really addicitive. In principle, all edges and pieces should match nicely. However, watch out when it comes to the ears. By mistake, I managed to let one ear point inwards, simply because one glue tab was connected to the wrong edge. You see how important it is to get the numbers right. The large pieces are for the backside. Try to attach this as the last part, however, I recommend to use a strong liquid glue instead of the adhesive tape here. Tape is not strong enough for the wall suspension. The panther head is sligthly inclined to the front. This means it cannot stand on its bottom side without e.g. the tape roll underneath it as you can see in the picture. Its also no problem to fix it at the bottom side if you like that better. Have a little patience and a a lot of fun when you try it yourself. And don‘t forget to subscribe to the newsletter! Is it too late to get the link to the PDF instruction ? I really want to try to make this..
Just klick on the following link. It will lead you to the lovely blog „Kreativbühne“ from Anastasia, where you can register for her newsletter. You will receive nice DIY Tutorials from time to time. The pattern for the panther is included. And you will find more nice patterns you will love! She has for example a new pattern for a 3d Origami Cow which is so cool!